I love personlis(z)ed license plates. I don't have one myself, but I love deciphering the ones that I see on the road. I saw this gem on my way home from work today on this lovely Toyota Prius. Well, I definitely don't drive a hybrid and I definitely don't get 44 miles per gallon. 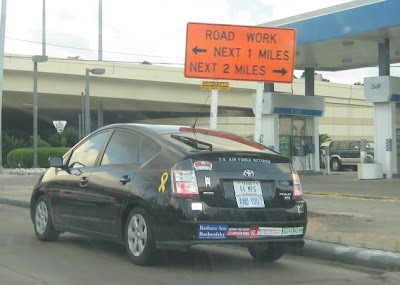 I love the fact that the stickers on the back of the car run the gamut from endorsing the US Air Force to the 100 Club, supporting the Democrat and Green Party and Humanism. Can one person really believe in all of these different groups? I think so. 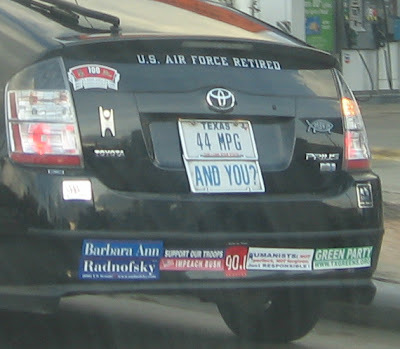 I believe in the Prius, in KPFT in the Green Party, in Humanism and also Objectivism. and, oh yeah, Darwinism too. Happy Purrthday to my fave bun, Lando. Lando is three years old today. In the Magnolia Cafe on South Congress in Austin, TX, over the first weekend for SXSWi2007 we had dinner with Dan and Annika. 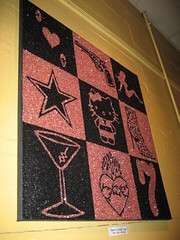 I had never seen the glorious art of the Glitter Diva, Sue Zola. The art was just fabulous. This one hung over the table we sat at. Isn't it gorgeous, dahling? Of course, as soon as I saw the Hello Kitty, I had to whip out my camera and photograph it for the Tofu Nation. Saturday was an absolute blur, there are so many panels to attend and things to learn and people to talk to that it is exhausting. I have been taking loads of pictures but I can't upload yet. My most exciting thing to report is that I met the founder of Dogster!! So cool. We chatted briefly and I gushed about how I love dogster.com and catster.com and that Mia and Ragamuffin have their own pages. 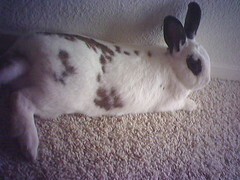 He was very gracious and asked me to email him the links to my pet's pages, so he could check them out. [live blogging]Live from Austin, TX at SXSW Interactive Festival. It's been a long time since I've come home to Austin. I am standing at the public kiosk to blog this little snippet. Austin is still my favourite city in Texas. It was the first city in the whole United States that I experienced when I arrived on 5/10/94. Austin was my first impression of the whole country. The company sponsored a group of us to come out to SXSW to learn and bring back the knowledge to share with the rest of us. DH is also here attending the Film Festival of SXSW. Photos and juicy blogging to follow shortly. You never know how you are connected to different people or different places. This is how I am connected to Sidney Poitier. I work for Ed Schipul who owns Schipul, the Web Marketing Company. My husband Raymond is a filmmaker. He was introduced to Natalie J, Radio Personality from Houston’s own KCOH by Ed who has known Natalie for a long time. Ray and Natalie started talking and she invited Ray on her radio show to be interviewed about his film, Electric Purgatory. 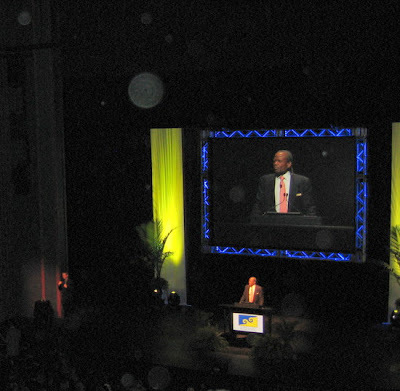 In the course of getting to know each other, Natalie found out that Sir Sidney Poitier was scheduled to speak at the Hobby Center on February 26, 2007. She researched the Hobby Center website to find out who the organizers of the event were and discovered that the event was being put on by the Brilliant Lecture Series. Natalie called up the organizers to see if she could get a Press Pass to film the event. She was able to get the Press Pass. She needed a cameraman. She called Ray. Ray, in turn was able to get a free ticket from Natalie for me to see Sidney speak. I took my free ticket and strolled into the Hobby Center and made my way to my free seat, Mezzanine Right, Row C, Seat 3. I was there by myself while Ray was downstairs with the rest of the press. 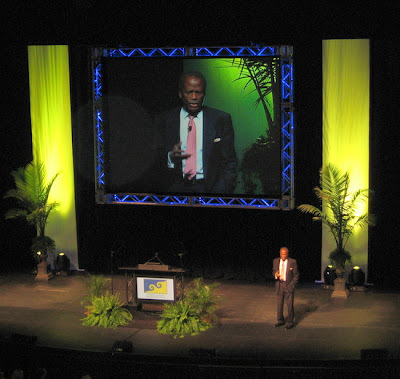 Sir Poitier spoke about life, living, his beginnings, what it is to be useful. He spoke with such ease and contentment about his life. He told stories about the people that he encountered in his life that changed the course of his life and how he was never always aware of the impact that these people had at the time they were impacting him the most. He was beautiful to watch and listen to. This man is 80 years old (and 6 days he added) and he is truly an inspiration. After his talk, there was a brief Question and Answer session where he took questions from the audience. All of the questions were fielded from the main part of the auditorium and most of the questions were asked by students. They ranged from Elementary age through to college. And then it was all over. I walked out, taking my time, knowing that I would have to wait for Ray to finish his camera work in the main auditorium. I made my way down the staircase to the main floor where I ran into another local filmmaker Marc Newsome. I hung around with Marc discussing the great talk by Sir Sidney. Marc ran into some friends of his and wandered off with them. I walk slowly to the steps to the stage, make my way to the bar and snag lovely glass of cabernet sauvignon. Wondering through the crowd, I notice a familiar face. I’m not good with faces but I realize that it is the ex-mayor of Houston, Mayor Lee Brown. I wonder around the crowd, taking in the scene. Ray finishes his camera work and comes out from back stage. There is a line forming to a roped off area. Ray has a drink and snags some hors d’oeurves. We try to get in the queue for the receiving line but one of the minders tells us that the line is closed. We banter back and forth but she’s firm on not letting us in the queue. No worries. The man is 80 years old (and 6 days). We wonder over to another part of the stage and watch the people greet Sir Sidney. After a while we note that the Queue Minder has left her post and we get back in the queue and make our way to Sir Sidney. The whole time; I’m desperately trying to think of something profound to say to the man when I get up there. Needless to say, I wasn’t able to think of anything amazing. When I got up to Sir Sidney, I shook his hand and his energy completely overwhelmed me. I thanked him for being an inspiration to me and to my family. Even recalling the moment now, I feel the energy. It was definitely an amazing experience. Ray and I then walked over to the stairs in front of the stage. We took in the scene one last time and slowly walked out of the hall, down the stairs to the underground parking, into the car. I will remember this night for the rest of my life.